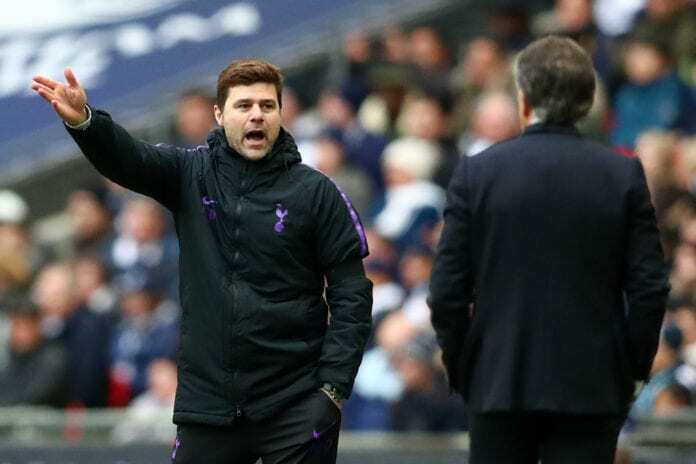 Tottenham boss Mauricio Pochettino heaped praise on his players following today’s 3-1 win over Leicester City. Davinson Sanchez netted an early opener for Spurs after being set-up by Christian Eriksen with the Danish playmaker later getting on the scoresheet himself in the 33rd-minute of the match. Son Heung-min then scored a stoppage-time third goal after Jaime Vardy had briefly put Leicester back into contention. The 3-1 win moves Spurs back to within five points of leaders Manchester City in third-place in the Premier League. “It’s a good time with the circumstances [to win]. I think my players are heroes. I repeat because our effort was amazing,” said Pochettino, according to Sky Sports. The Argentine coach insists Son was unfairly booked as he didn’t dive in the area from Harry Maguire’s challenge. He added: “It wasn’t simulation first of all. It was a little bit unlucky. “During the game the referee was good but we didn’t have luck in that situation because that was a clear penalty. “Son, when he scored the third goal, he showed how he is with his character, personality and capacity to run more than 90 minutes. Pochettino also provided an update on Eriksen’s future at Spurs following another superb performance today. “We’ve spoken a lot about that, now we need to keep going, for him to continue performing in his best and of course I told you before he’s such an important player for us,” He added on Football London. “We’ll see what happens. I think I’ve used a few metaphors in the past about Christian, remember related with my family and my dog.